← OUR READ SHORT FICTION EDITORS’ INTERVIEW IS UP ON DUOTROPE NOW! If you’ve listened to any of my radio interviews, then you know that I’ve often credited my love of ghost stories to W.W. Jacobs’ “The Monkey’s Paw,” which I read when I was probably way too young (I had the most vivid imagination and all it took was the right mental image to make my life—and my parents’—a hellish experience for nights on end). There’s a reason I love Dali’s painting “Persistence of Memory”—because time can warp how we remember things so easily. 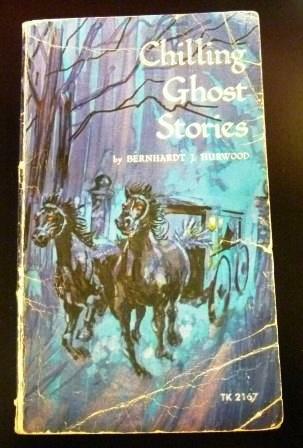 When I was sorting through boxes of things to toss because we’re moving, I came across a beloved childhood book I’d forgotten about—Chilling Ghost Stories by Bernhardt J. Hurwood. Published by Scholastic in 1973, I had undoubtedly bought it at one of the Book Fairs at our elementary school. As I held it in my hands, I remembered, suddenly, a terrifying mental image that had come from one of the stories in the book—and subsequently, that “The Monkey’s Paw” actually wasn’t the piece that inspired my love of ghost stories. It was the story that had sparked this one horrifying image. I recalled enough of the story’s details (as well as the image itself) that it wasn’t hard to figure out which one it had been: “The Midnight Ghost.” I won’t put the details here, as I don’t want to spoil it for anyone. What I will say about “The Midnight Ghost” is this: despite the fact that it’s written for young children, it’s still pretty scary. What makes it scary, in this case, are the lean and simple descriptive details. Just a few elementary-school-level words in the right order can yield frightening, definitive, powerful images. And I was reminded that sometimes the best scares are the simplest. Even if you’re an adult, you’ll want to own this. I can guarantee a scare in under three minutes. And if you’re as busy as I am—well, then there’s a certain beauty in that, too. Posted on November 10, 2011, in GhoStory Guru and tagged Bernhardt J. Hurwood, Ghost Stories, scary Scholastic books. Bookmark the permalink. Leave a comment.